So, what is a MARKETING stream? A Marketing Stream is a multi-year canola delivery agreement to sell up to 25 bpa through Input Capital’s top-tier marketing program. 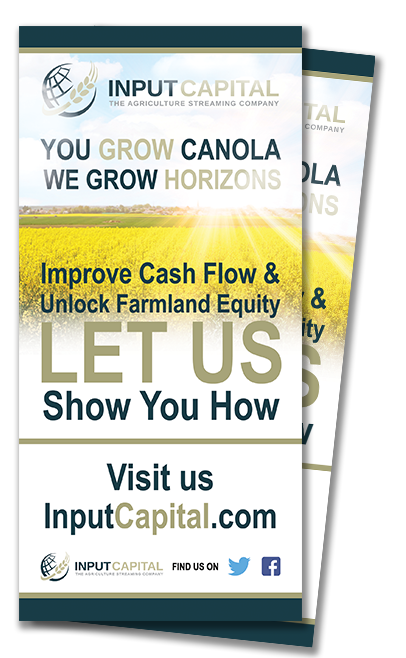 Input Capital will pay you a cash deposit of up to $50 per tonne, upfront, for the right to sell some of your future canola production on your behalf. Input Capital then pays you up to 95% of the final selling price realized by us. The Marketing Stream allows farmers to tap into the volume grain prices we negotiate, volume freight discounts, and our extensive experience & expertise with puts, calls, and hedging. Input Capital looks to maximize the price at which we sell canola and targets selling in the top 20 percent of canola prices available each year. We have a team that focuses on marketing and logistics every day, 12 months a year. And, in case we didn’t mention it, we also pick up the canola at your farm, saving you time and trucking costs. The Marketing Stream is about accessing better canola marketing opportunities and higher prices by joining Input Capital’s canola marketing program. As a farmer, how do I benefit from a Marketing Stream? Deposit: We pay you up to $50 per tonne, upfront, for the right to market a portion of your future canola production. Crop Payment: We communicate what your crop payment will be on August 15th each year. You will know the price for your canola while you are sitting in the swather. Your crop payment can be as high as 95% of the final price we receive depending on the contract type you select. Strategy: Our program includes puts, calls, hedging and other paper trading strategies to improve price. Time: Free up time associated with marketing allowing you to work on other projects. We have a full-time, dedicated canola marketing team that focuses 100% of their time on getting the highest price, the lowest basis, and best rate on trucking, 12 months a year. We target to be in the top 20% of canola prices each year. Take advantage of volume pricing on 100,000+ MT of canola marketing each year. No geographic restrictions – we deliver to the highest paying buyers. Save on freight – tap into our volume and network of trucks. On-Farm Pick Up: We pick up the canola on your farm, saving you delivery costs and saving you the cost associated with additional storage. How much canola can I commit to Input Capital on a Marketing Stream? Every contract is unique, however, in a standard Marketing Stream, there is a minimum commitment of 40 MT per year (one semi-truck load). And we’ll go as high as the equivalent of 25 bushels per acre each year. How are streaming prices established for a Marketing Stream? The Final Declared Regional Price is determined by the price that Input Capital achieves by selling the canola to elevators, crush plants, exporters, etc., plus any gains achieved through our paper trading activity and all the savings and benefits we achieve negotiating freight discounts, better basis, higher premiums, etc. Marketing Stream prices are finalized on August 15th each year. This provides our experts the time necessary to achieve the highest net price for you. What happens if canola prices climb or drop drastically during the contract period? Since this is a variable price program, Input Capital and farmers share in the upside and the downside of the canola market. Since we are working to achieve the highest prices 12 months a year, we can take advantage of positive cycles and share the benefits. What happens if I have a crop failure? Input Capital requires that our streaming clients carry crop insurance at the 70% level of coverage. Input has several options to help ensure that our farm clients are able to continue farming in the event of a crop failure. Does everyone qualify for a Marketing Stream? Most producers will qualify for a Marketing Stream. What risks does Input Capital take on in this agreement? Input Capital takes on the same price risk as the producer, and shares in the same benefits. Our interests are completely aligned with your interests. When the canola price goes down, we make less money. And when the canola price goes up, we make more money. Our goal is to succeed because you succeed.